Ever wondered how the Ocean Health Index gets data for its global assessment of the entire ocean? There's more to it than you'd guess! And Marine Regions is part of the answer! The Ocean Health Index is a valuable tool for the ongoing assessment of ocean health. By providing a means to advance comprehensive ocean policy and compare future progress, the Index can inform decisions about how to use or protect marine ecosystems. The Index is a collaborative effort, made possible through contributions from more than 65 scientists/ocean experts and partnerships between organizations including the National Center for Ecological Analysis and Synthesis, Sea Around Us, Conservation International, National Geographic, and the New England Aquarium. The Ocean Health Index measures the global state of the world's oceans. An Index score for 220 countries and territories, the Antarctic region, and 15 sections of the high seas, is calculated using existing global data. The results are shown on the exclusive economic zone (EEZ) of each coastal country, an area that extends 200 nautical miles (370 KM) offshore from the country’s coast. However, several marine territorial disputes exists when it comes to EEZs. Such disputes can only be solved by international agreements in accordance with UNCLOS and resolution is complicated and slow. Projects such as the Ocean Health Index can only use agreed boundaries. Exclusive Economic Zones and Boundaries (EEZ) - version 10. Author: Nathalie De Hauwere, VLIZ (download full size here). 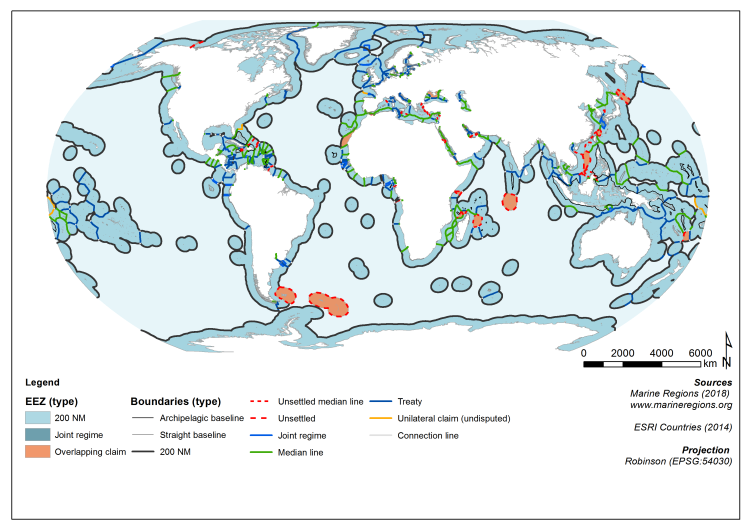 The only publicly available source for that information is the Marine Regions database compiled by the Flanders Marine Institute (VLIZ), which uses methods shown here. VLIZ adds corrections during its regular database updates, so whenever countries resolve boundary disputes, their newly agreed EEZ boundaries will become part of the updated database. In the meantime, VLIZ maintains information on the disputed areas. Disputed areas are excluded from the scores calculated by the Ocean Health Index. If/when new EEZ boundaries are determined, scores can easily be recalculated. (Source: article written by Dr. Steven Katona, Managing Director, Ocean Health Index, about how the Ocean Health Index gets data for its global assessment of the entire ocean (read the original article here)). More information about the data used in the Ocean Health Index can be found here. 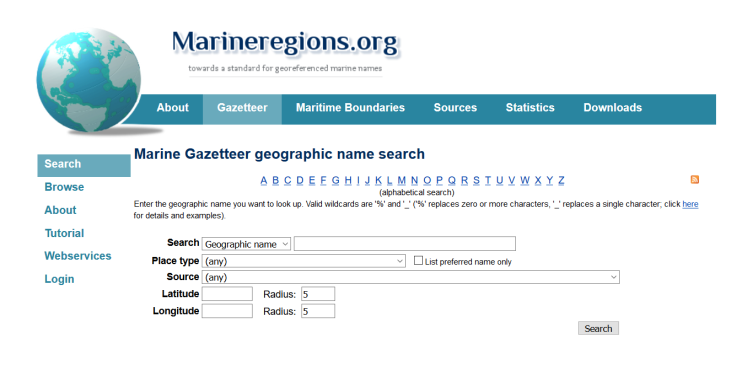 Marine Regions is a standard list of marine georeferenced place names and areas. It integrates and serves geographic information from the VLIMAR Gazetteer and the MARBOUND database. The purpose of Marine Regions is therefore to create a standard, relational list of geographic names, coupled with information and maps of the geographic location of these features. This will improve access and clarity of the different geographic, marine names such as seas, sandbanks, ridges and bays and display univocally the boundaries of marine biogeographic or managerial marine areas.